How should I start if I wish to enroll to the AFP Certification? I am a Bachelor’s Degree holder, what is my entry route if I am interested in obtaining the AFP Certification? I am an undergraduate student, what is my entry route if I am interested in obtaining the AFP Certification? I have a Master's Degree, what is my entry route if I am interested in obtaining the AFP Certification? I am a member of a professional body, what is my entry route if I am interested in obtaining the AFP Certification? Where can I take the AFP Certification Education Program? How often will the education providers offer the AFP Certification Education Program? Can I self study the AFP Certification Education Program? Where can I get the syllabus of the CFP Certification Examination (Foundation Level)? How much is the fee for CFP Certification Examination (Foundation Level)? If I am taking the CFP Certification Examination (Foundation Level) through "Fast-track to CFP Certification", what study support will I get? How often will the IFPHK offer the CFP Certification Examination (Foundation Level)? Is the CFP Certification Examination (Foundation Level) paper bilingual? How many questions are there in the CFP Certification Examination (Foundation Level)? What is the time allowed for the CFP Certification Examination (Foundation Level)? What are the pass scores of the CFP Certification Examination (Foundation Level)? If I fail the CFP Certification Examination (Foundation Level), is there any restriction to re-sit the examination? 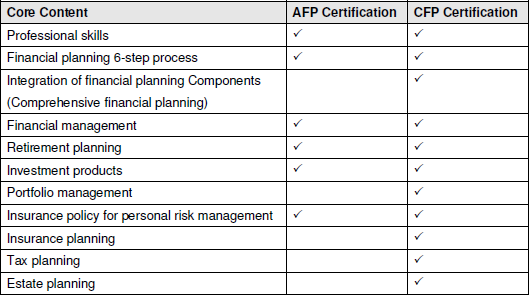 What are the certification requirements for the AFP Certification? What are the certification fees for the AFP Certification? It is compulsory for all individuals to register with the IFPHK as a Candidate before one is eligible to proceed with his/her AFP Certification. One must possess valid Candidacy before he/she can enroll to an education program or register for an examination. The IFPHK Candidates will, from time to time, receive useful study tools such as sample questions, exercises, study guides, education and examination schedules and much more. The AFP Certification consists of a 120-hour education program and a three-hour examination paper. The IFPHK recognizes your academic and professional qualifications and depending on your background, your may be allowed self study for the examination. Please refer to information on the requirements for AFP Certification. To become eligible for AFP Certification, individuals must maintain continuous annual registration until he/she becomes an AFP certificant. I am a Bachelor's Degree holder, what is my entry route if I am interested in obtaining the AFP Certification? Graduates with Bachelor's Degrees awarded by accredited educational institutions can self-study through the AFP Certification Education Program, and directly attempt the CFP Certification Examination (Foundation Level). Students studying towards a Bachelor’s Degree awarded by an accredited education institution can self-study through the AFP Certification Education Program CONDITIONALLY. They may directly attempt the CFP Certification Examination (Foundation Level). However please note that this admission to the examination DOES NOT imply fulfillment of the education requirement for AFP Certification. Candidates admitted through this path are required to show evidence of completion of the relevant degree program (or any other qualification eligible for exemption) upon certification. Master's Degree holders in Economics or Business Administration awarded by accredited education institutions can self-study through the AFP Certification Education Program, and directly attempt the CFP Certification Examination (Foundation Level). Depending on which professional designation you possess, you may be eligible to self-study through the AFP Certification Education Program, and directly attempt the CFP Certification Examination (Foundation Level). You may refer to the Lists of "Fast-track to CFP Certification" for further information. Click here for the education curriculum. Self-study is only offered to Candidates with Bachelor's Degrees or above awarded by accredited educational institutions and holders or certain professional qualifications. You may review the LIST here. If you do not possess any academic or professional qualifications as stated above, but you have completed certain Sub-Degree/Higher Diploma program that are eligible for applying transcript review, you may be exempted from taking the education program. The Examination Syllabus is available at the IFPHK website. Click here for the current examination fees for CFP Certification Examination (Foundation Level). Candidates admitted through "Fast-track to CFP Certification" are required to purchase the required textbooks for the education programs. As a Candidate to the certification program, an online login to a designated area in the IFPHK website will be provided to you to get the updated information including a study guide, exercises and sample examination questions. The CFP Certification Examination (Foundation Level) will be offered four times per year, usually in March, June, September and December. Enrolment will usually start two months before the examination date. CFP Certification Examination (Foundation Level) consists of around 90 - 100 multiple choice questions. The time allowed for CFP Certification Examination (Foundation Level) is 3-hour. The pass scores for the CFP Certification Examination (Foundation Level) will be determined in accordance with standard pass-score procedures for certification examinations. Because of the procedures adopted, the pass scores may vary from examination to examination and are not disclosed. You may refer to the Examination Handbook if you wish to learn more about the pass score.